Cape Breton Tourism Spotlight: The Magicial Season of Christmas is quickly approaching, and if you have been looking for one of the sought after Elf on A Shelf creations I maybe able to help you out! The Magicial Season of Christmas is quickly approaching, and if you have been looking for one of the sought after Elf on A Shelf creations I maybe able to help you out! I love Christmas and all the holiday traditions that goes with it. I love the story of the elf on the Shelf in case you have not hear about the Elf on The Shelf below you will find some background information on what the elf is all about. The poetic story dictates that the elf's main priority around the family's household is to keep watch over the children's behavior during the day and return to the North Pole overnight to report their behavior to Santa Claus, detailing any acts of obedience or misdeeds performed by a child during that particular day, returning home by the following morning. Starting from the day following Thanksgiving to Christmas Eve, the elf remains with its family to ensure that they behave properly throughout the holidays. However, the top policy regarding the Elf on the Shelf is to refrain from touching the creature, as doing so could permanently erase any Christmas magic with which the elf had been bestowed upon being named by the family. It is no longer capable of fulfilling its duties of recounting the events of the day to Santa Claus, cautioning that he may or may not learn about a child's behavior should the Elf on the Shelf be stripped of its holiday enchantment. Every day, the elf's position changes, providing the family with the responsibility of locating its current perch before its departure for the year on Christmas Eve. These very sought after elfs are not always easy to come by, so if you are looking to find a location where you can get your child his or her very own elf on the shelf, I am happy to be able to relay the information that Glad Tidings the Christmas Shoppe in St. Peter's has just received a shipment in. 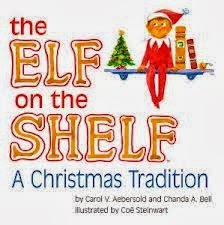 "THE ELF ON THE SHELF" has arrived in stock today!!!!!! Along with the Elf Kit with boy or Girl Elf they also have a sweater for the boy a skirt and a tutu for the girl elf.